I am sitting in my kitchen, listening to my “Aladdin” channel on Pandora and what should come on but the “Genie Medley”? I cannot explain to you the happiness that you bring to my heart. Your effervescent joy in what you do, the energy and life and pure magic that you bring with your love for theatre and especially all things Disney. I have been a Disney baby from the beginning. “Winnie the Pooh in the Hundred Acre Wood” and “Mousercize” in the mornings before school, “Chip and Dale: Rescue Rangers” and “Duck Tales” after I came home. The first film I even remember going to at the cinema as a child is “The Little Mermaid”. Disney is in my blood and to hear and see (on Youtube) the magic that you and the cast bring to “Aladdin” (my husband’s favorite Disney film, by the by) makes me indescribably happy and I dearly hope that I will get to see the show live before it closes (hopefully) long from now. I want to thank you. Thank you for the smiles, the beauty, the jubilant triumph that have me cheering and applauding in my car after the finale of “Aladdin”. Thank you for the hours lost in the music and the joy of singing for and dancing with my toddler daughter. Thank you for all that you have done to make a beautiful tradition in our family fresh and alive and new and so absolutely joy-fillled. Thank you! It seems such a small thing to say but I absolutely mean. Cross my heart and double pinkie-swear. Thank you! Indeed, I felt much better for the writing of it and pouring all that feeling out. I continued on with life, not really expecting to hear anything in return, what with the popularity of the show and all. But then I got a great surprise in my Inbox! Mr. Iglehart wrote back, and, for a moment, I turned into a sixteen-year-old groupie, bouncing and squealing. Finally, I settled myself down enough to sit and actually read his note, which was really sweet. We shared memories of favorite cartoons and “first” Disney movies and it was really nice. It absolutely made my day and a trip to NYC to see “Aladdin” is definitely pushing ahead in the choices for our tenth anniversary trip. Then, yesterday, after picking up my mother for her visit, we went to the mall and met up with a friend of mine and her gorgeous infant son (who always gives me the greatest smiles). We went to the Disney Store and, together, my friend and I sang freely along with “For the First Time in Forever” and I felt that joy born of all the precious Disney memories bubbling up again. No one told me to be quiet and I truly didn’t care if I got weird looks or not. In fact, one of the associates working there came and sang along with us for a moment as she made her rounds in the store. My daughter got to run around one of my favorite stores and found herself some plushies of beloved “Doc McStuffins” characters. All in all, it was an absolutely fabulous time. Thank you, Disney and all of your “family” members, for being such a blessed and happy part of my life. Thank you for the magic of memories and I cannot wait to continue sharing them with my husband and my daughter as she grows. 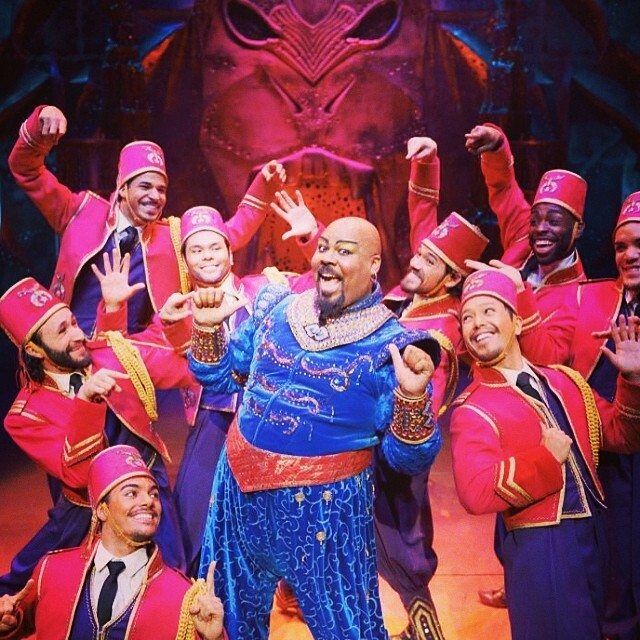 James Monroe Iglehart as the Genie in “Aladdin” on Broadway. I love this letter! I believe he will like it! I am also a fan of Aladdin on Broadway.